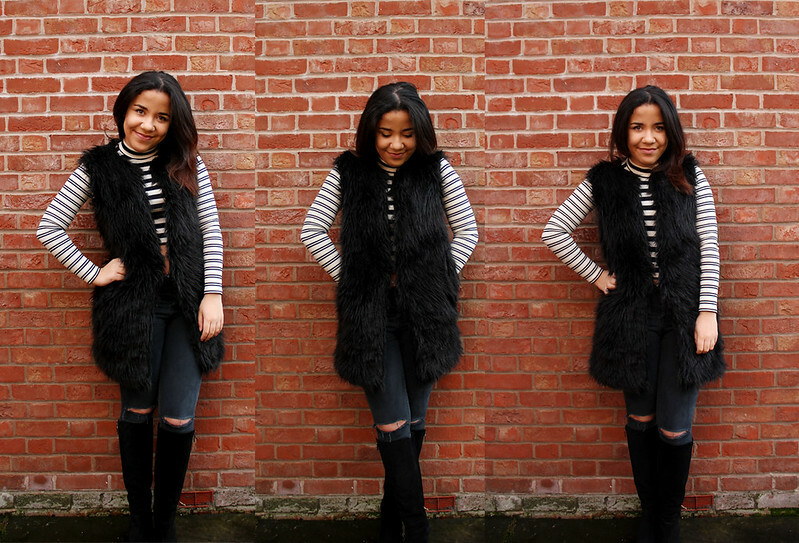 Black Fur Gilet - Missguided (Similar Here and here) Ripped Jamie Jeans - Topshop Knee High Boots - Daniel Footwear(*) (Similar Here) I'm slowly getting into posting outfits again. It feels like forever since i did this regularly (I normally take my photos all at once) and now I am just taking some photos whenever the weather decides to be nice! I recently picked up this striped top from Topshop and I love it. It's so versatile and easy to wear and looks amazing with my high-waisted ripped jeans from Topshop. Black Fur Gilet - Missguided (Similar Here and here) Ripped Jamie Jeans - Topshop Knee High Boots - Daniel Footwear(*) (Similar Here) I've literally not taken my Daniel Footwear boots off since I got them. They're so comfy and look so stylish. I love pairing them with jeans and I love how they show off the rips in my jamie jeans really well. I really like wearing my gilet too. It keeps you so warm and when i'm going somewhere quickly in the car it's so easy to throw on. This is the sort of outfit I'd wear if I wanted to make a bit more of an effort with my look and if I felt a bit more stylish! I love this combination together and how the striped crop top doesn't make my outfit look too black. Very nice look ! Love the fur a lot ! That vest is amazing, looks great on you! !